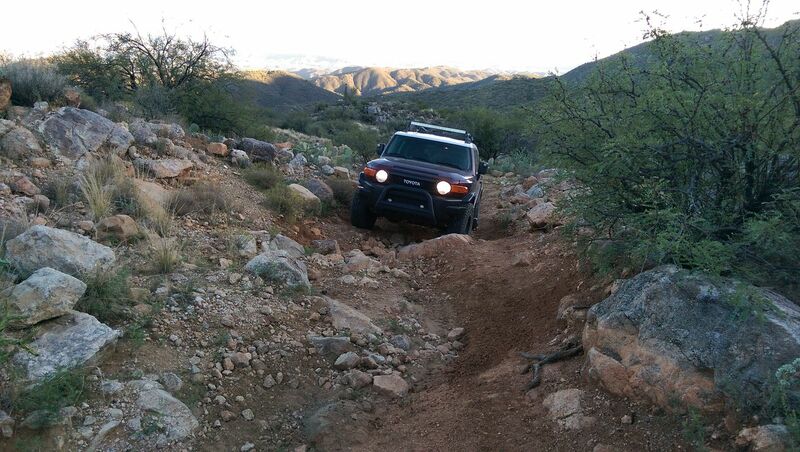 If you really want to take that trail less traveled, look no further. 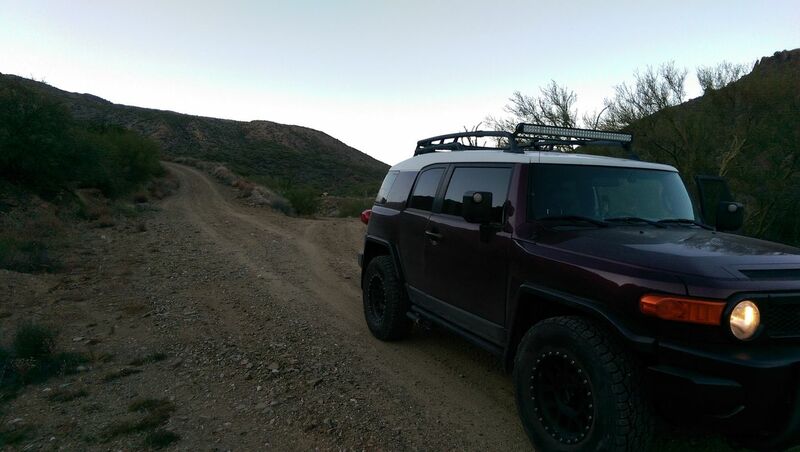 This Black Canyon Off-road Trail - not to be confused with the Black Canyon Hiking Trail that can be found in the same area - is a poorly documented, barely mentioned - and until now unmapped - skinny, windy, hilly, and in some areas very rocky road that requires a decent off-road 4wd vehicle. 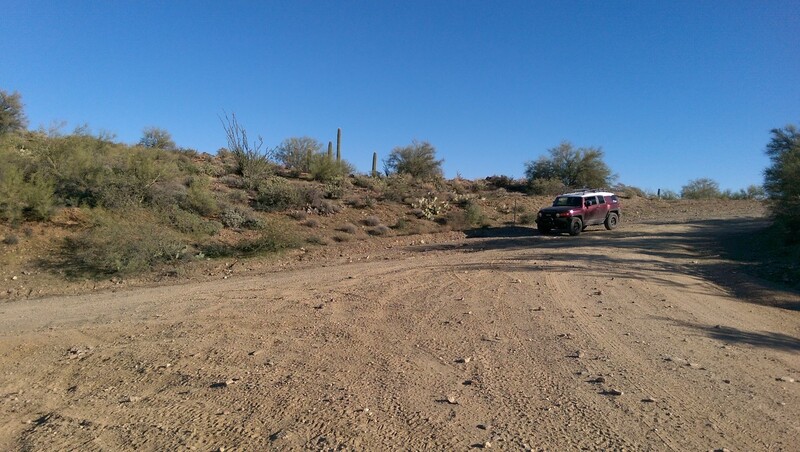 It winds through the mountains between Black Canyon City and Table Mesa Recreation Area on land managed by the Hassayampa BLM Field Office, giving it the name of Back Way to Black Canyon City, or Black Canyon OHV Trail. 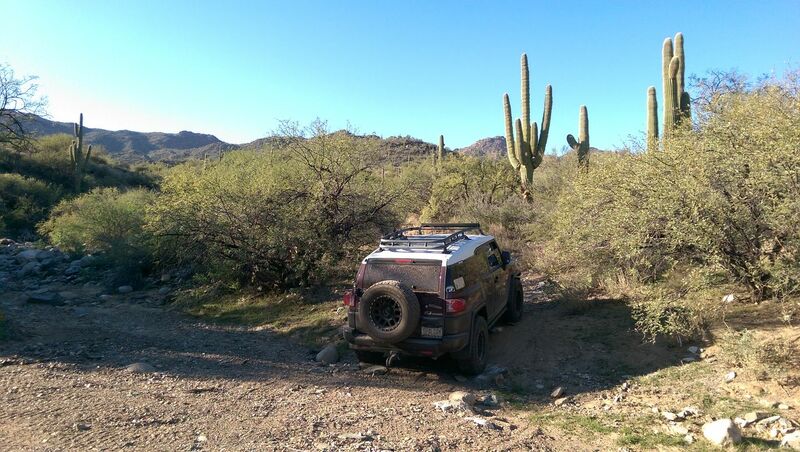 The trail is overgrown along some portions ensuring you'll get some all natural Arizona pinstriping on your vehicle and provides plenty of technical spots for a long challenging ride through the scenic mountains. 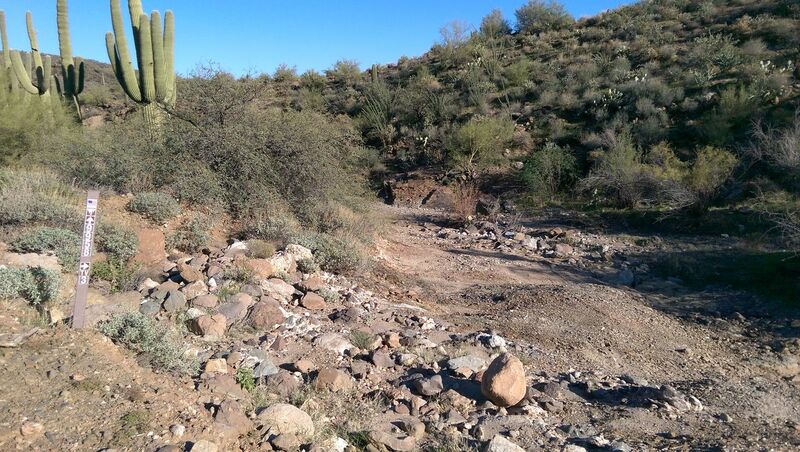 If there have been recent heavy rains, you can expect some washed out areas as well. 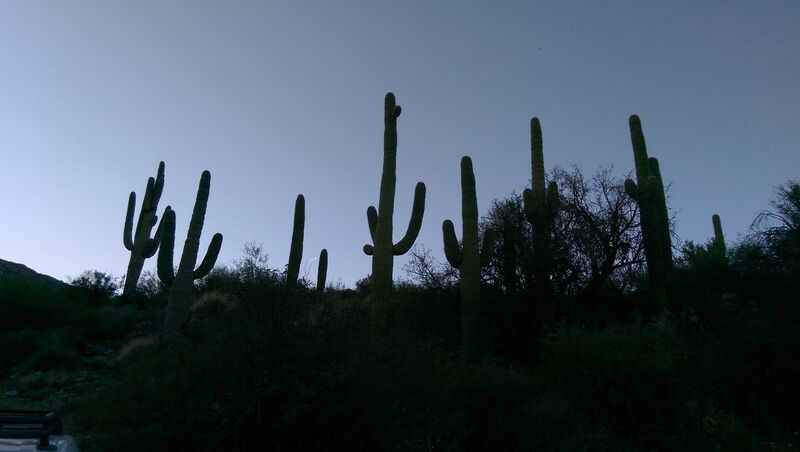 It has lots of high desert cacti and foliage to view, and you'll also find yourself up-close to some cliffs, driving through deep dry river beds (unless it's stormy), and finding some interesting rock formations along the way. 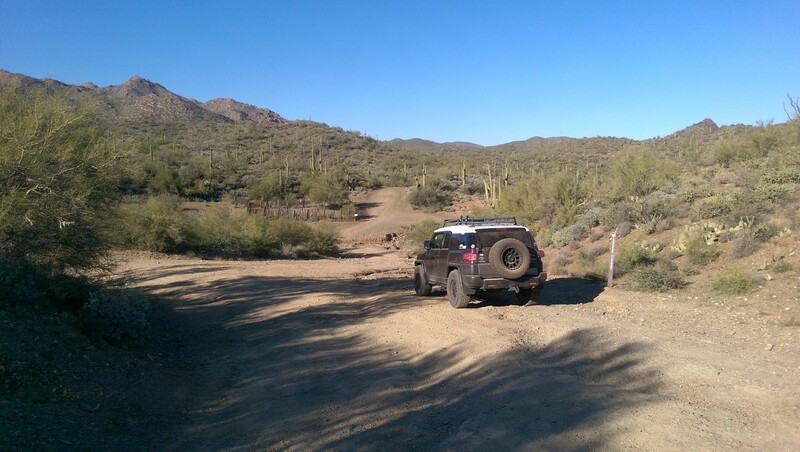 The back way to Black Canyon City is a BLM off-road 4wd trail that travels parallel to the Black Canyon Trail's hiking network. It's very skinny in spots, being only one vehicle wide in areas where passing cannot be accomplished at all. 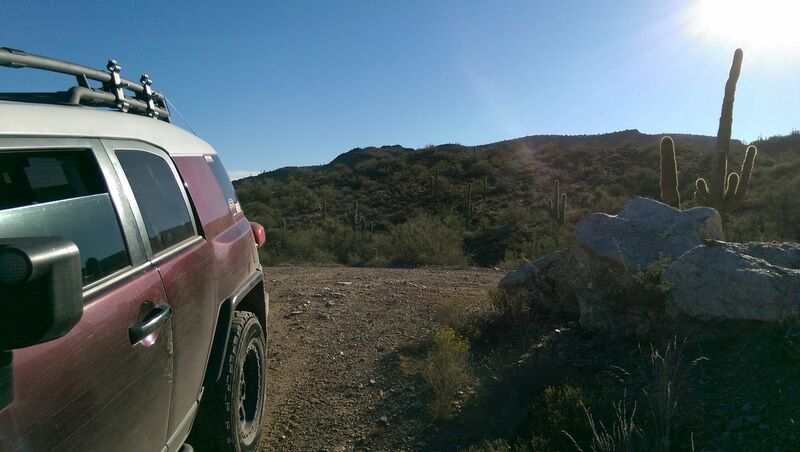 In other areas, passing most likely will require both vehicles going slightly off the trail while avoiding any cacti plants that could puncture even the toughest rock crawling tires. 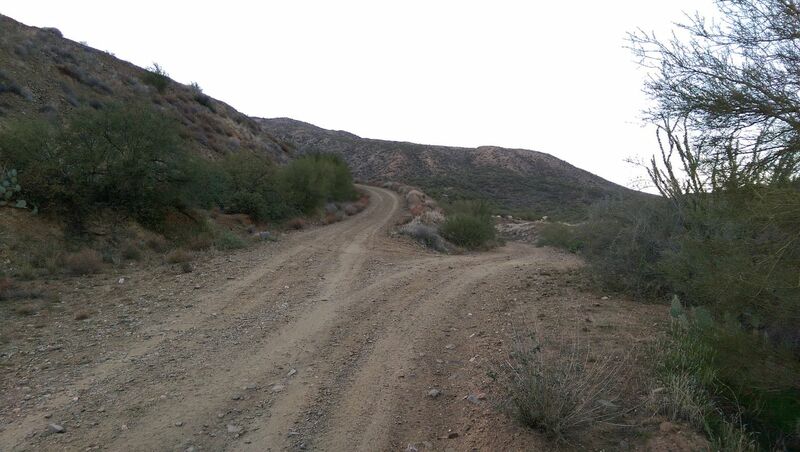 The southern half is otherwise not difficult as you drive on well-packed dirt through gentle curves and hills. However, further north, especially north of Slate River, you'll find larger rocks, looser dirt, tighter turns and steeper hills. 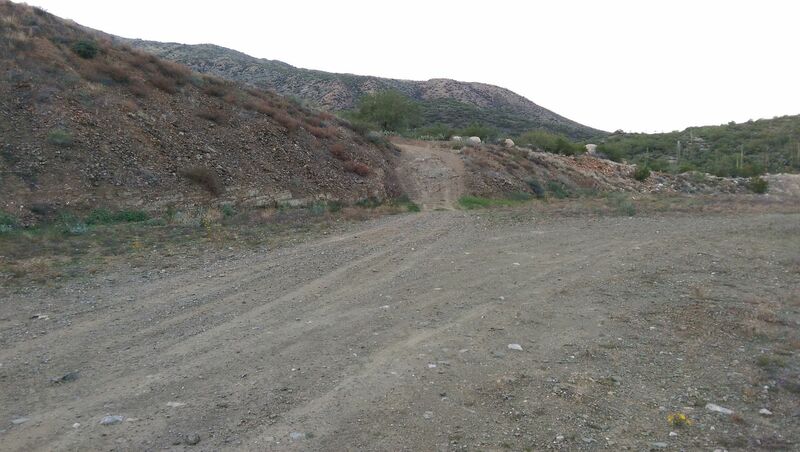 There's even a few hundred foot long section of the road that was chiseled out of a steep rocky hill-side. 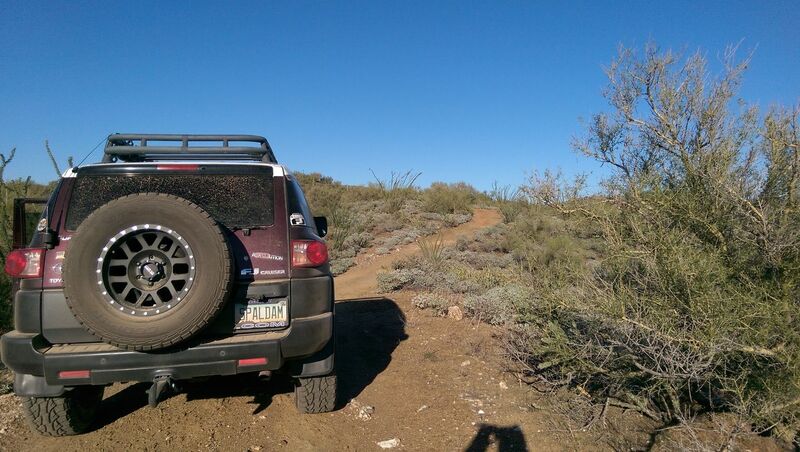 Four-wheel drive is definitely a must, and some spots require larger tires with a locker and/or a traction control system highly recommended. There's also the danger of areas being washed out creating potentially dangerous conditions. From this intersection, head North. 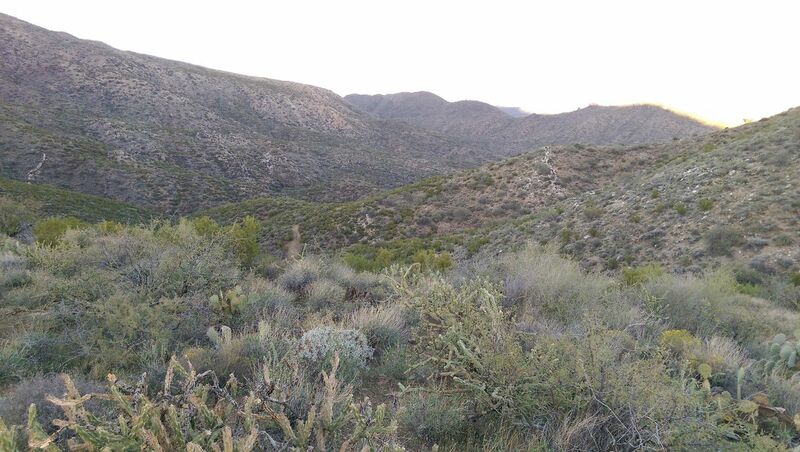 To the South is BLM 9999 Trail that goes through the Table Mesa Recreation Area, and to the West is BLM 9959 Trail that head to Tip Top Mine and the Bradshaw Mountains. Continue straight (north) on 9958. 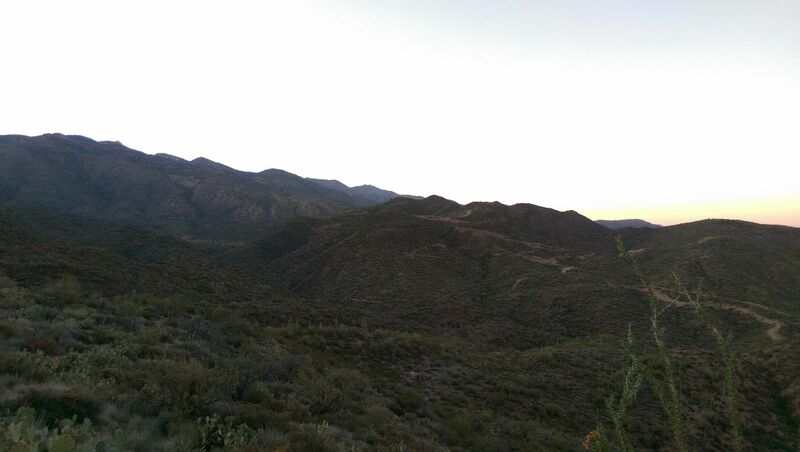 To the right (east) is the northern trailhead to Upper Terminator. Continue straight (north) on 9958. 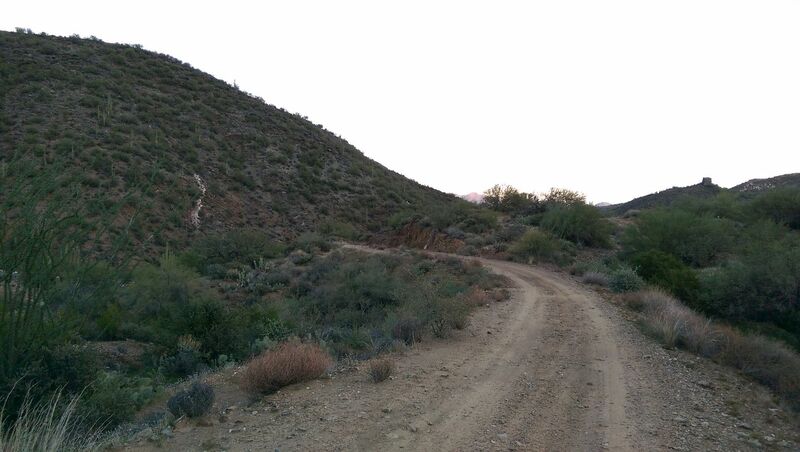 To the right (east) is the northern trailhead to TV5 (optional Upper Terminator extension). Stay to the right (east) for 9958. 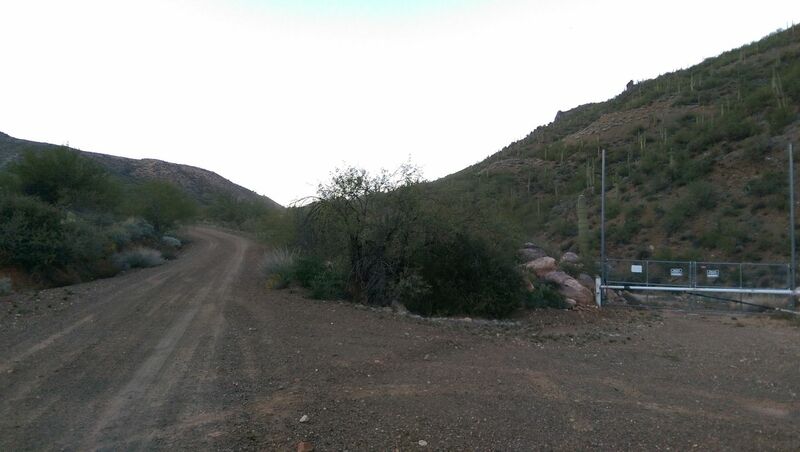 To the left is the entrance to AZCO Mine where there is plenty of primitive dispersed camping. Stay to the right (east). Left eventually stops at a dead end. The trail narrows considerably from here northward, until you reach waypoint 18, making passing and turning around considerably more difficult. 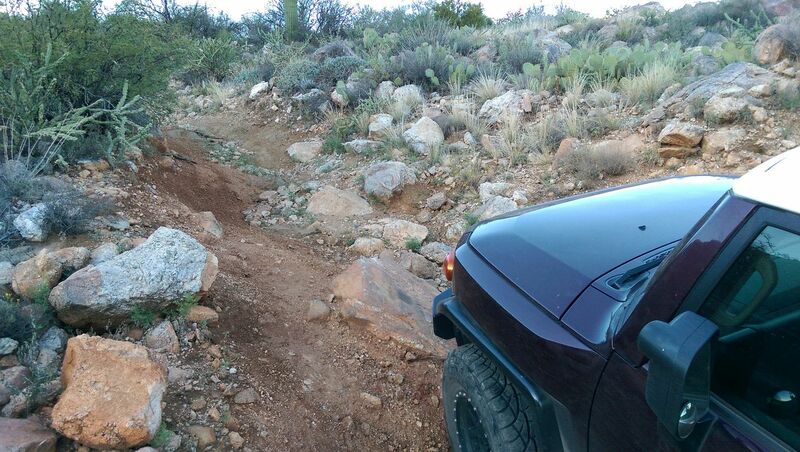 The density of cacti also increases, making driving on the side of the trail much more dangerous to your tires. After getting into the deep wash look slightly to your left (northwest) to find where the trail heads back up out of the wash. 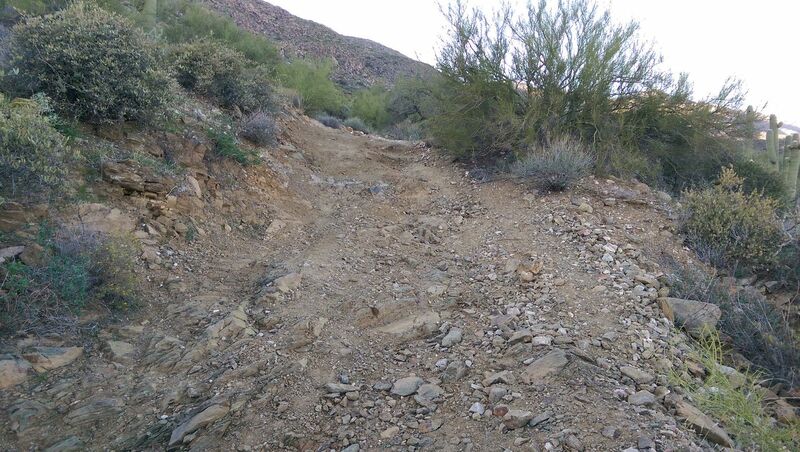 This wash eventually feeds down into [Lower Terminator](http://www.trailsoffroad.com/trails/1127-lower-terminator-tv2) and Collateral Damage trails, but may only be passable on foot. 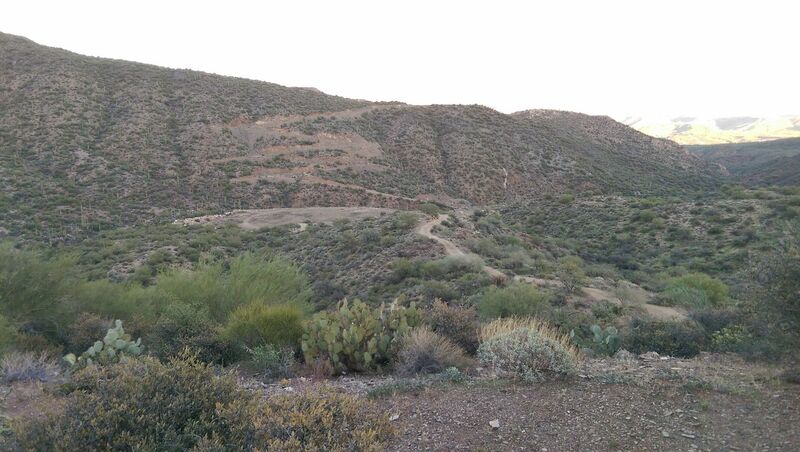 This hill provides a nice view of the southern portions of the trail. The trail starts to get a bit loser with some small rocks. 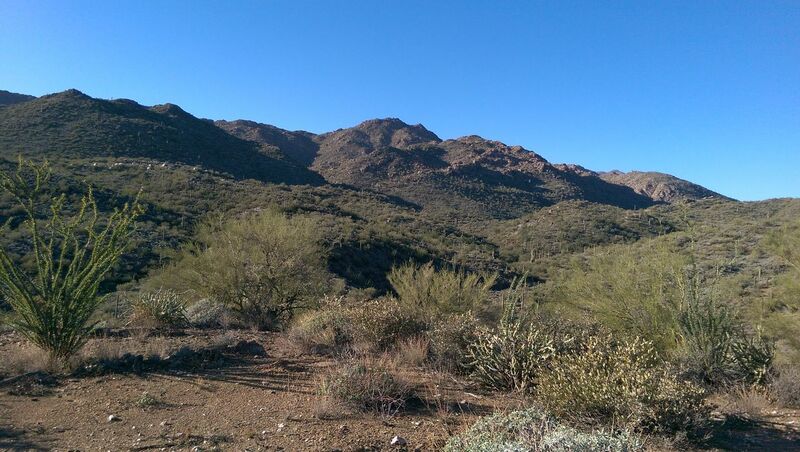 Another scenic area along the trail. This is were the trail starts to get more interesting. 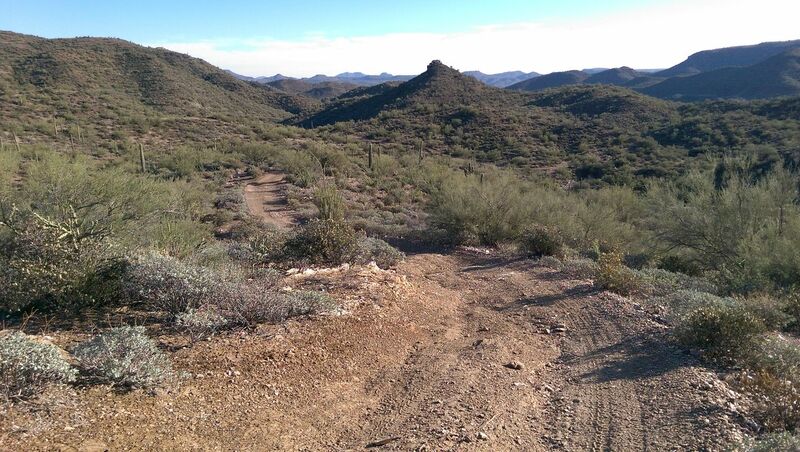 From here north there are larger rocks, looser dirt, tighter turns and more extreme hills. 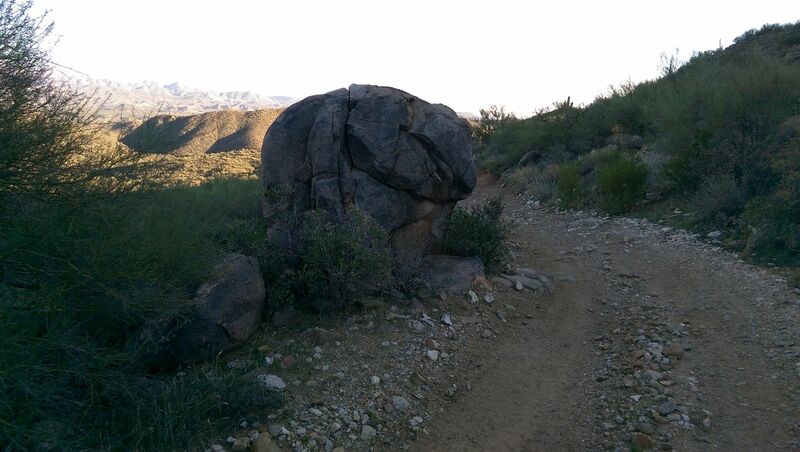 This large rock looks kind of like a head, or a helmet. 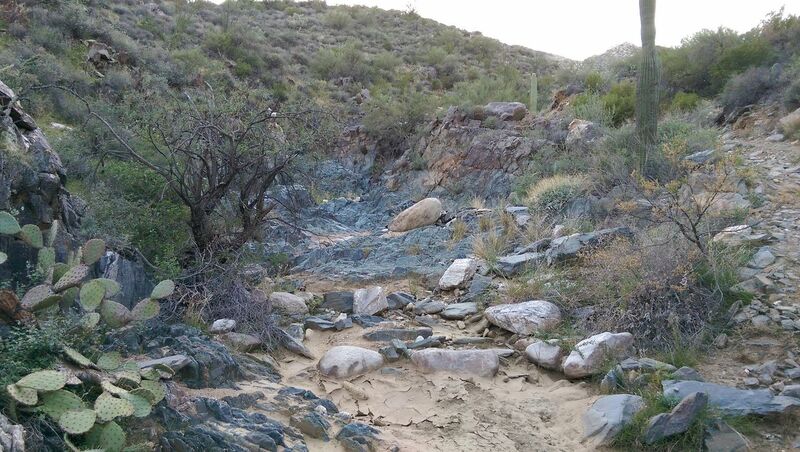 This wash is the most pronounced along the trail. Decent entry and departure angles are needed. This is Slate River. It feeds down from near the Tip Top Mine area. 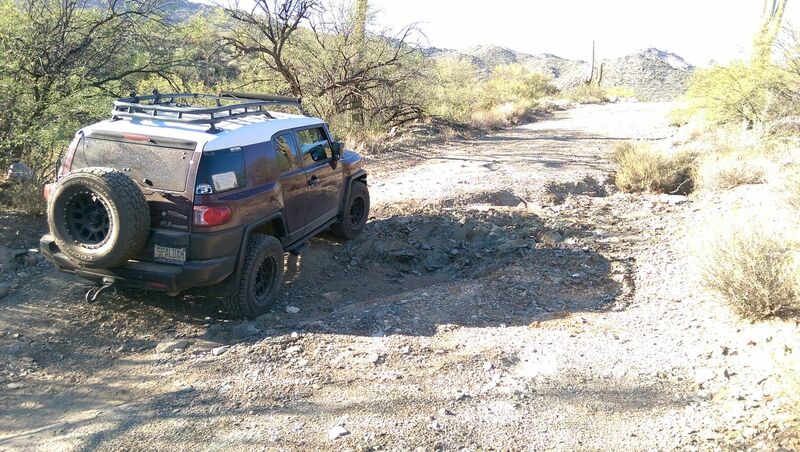 I've seen maps suggesting one could drive up the river or hike it, but the terrain is going to be quite difficult. It would be best to stay on the main trail. 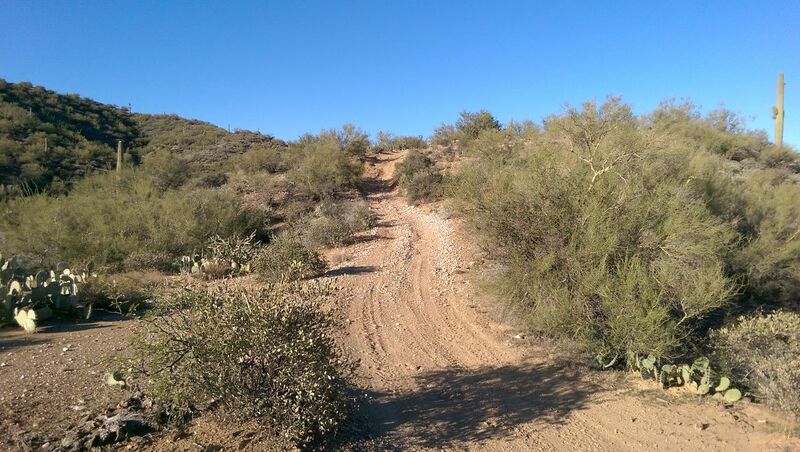 If the trail so far has been difficult or troublesome for you, now is the time to turn around. It only gets more challenging from here on. Turning around beyond this point can be extremely difficult. 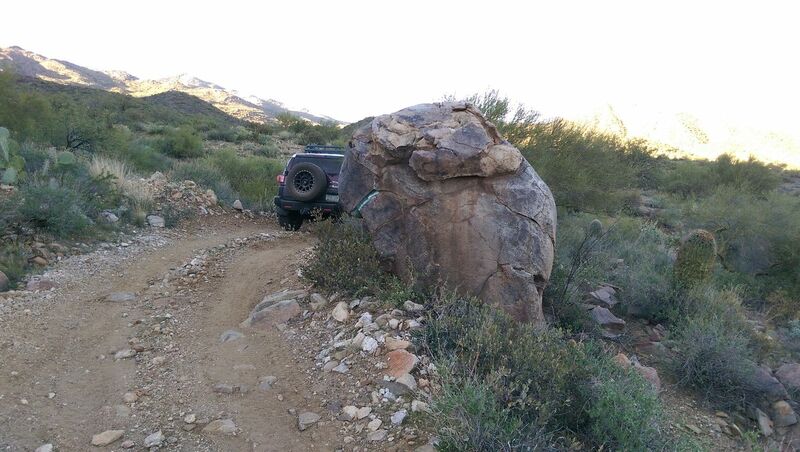 The rocks get much larger through this area requiring high clearance. The dirt is also loose, so some kind of traction control may be necessary - like a locker or limited slip - depending on your rig's capabilities. 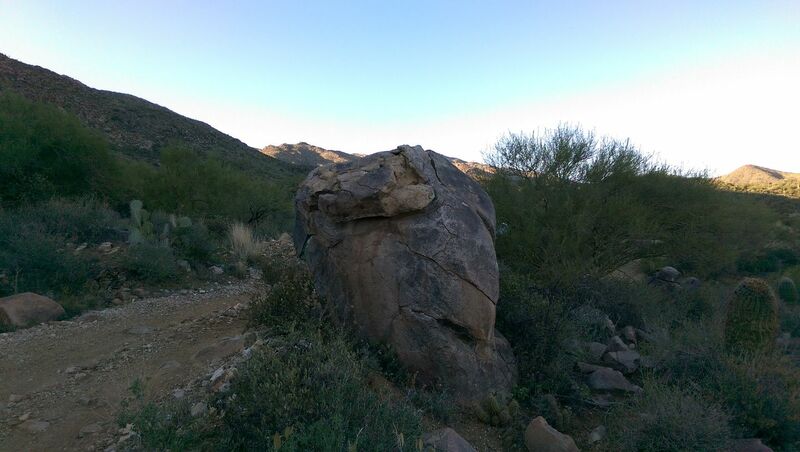 The sides of the trail through this area are full of large boulders and steep side hills as well. 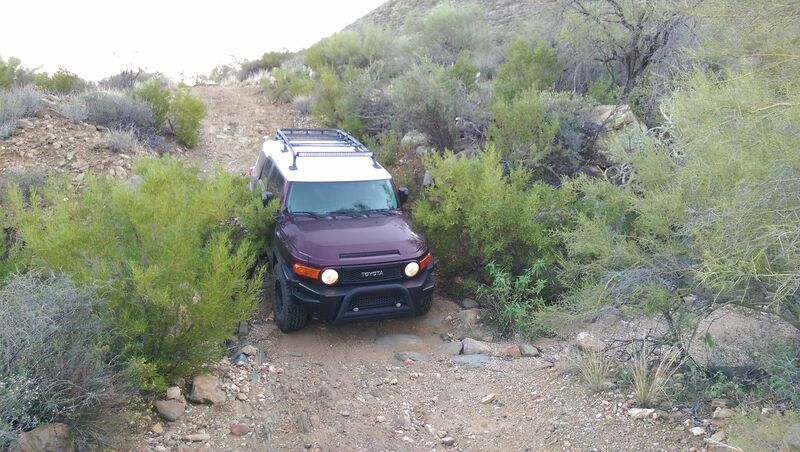 You'll also find a few sections of the road next to the side of a cliff leaving you with no options for passing or bypassing obstacles. This area gives the trail its highest rating, but some aspects could be seen as a higher technical rating in certain respects. 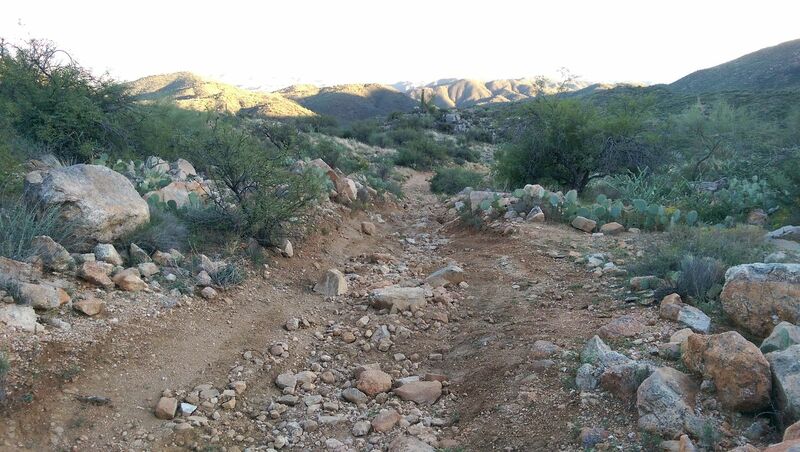 Trail conditions can also change drastically depending on recent weather. This is the highest elevation along the trail. 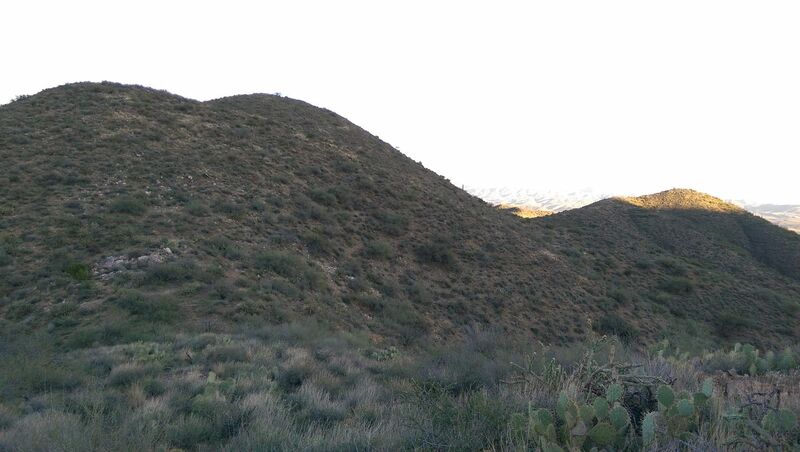 The hills are steep, windy, and narrow through this area as well. Turn right (east) down the side of the hill. If you go straight here you'll end up at the camping spot. 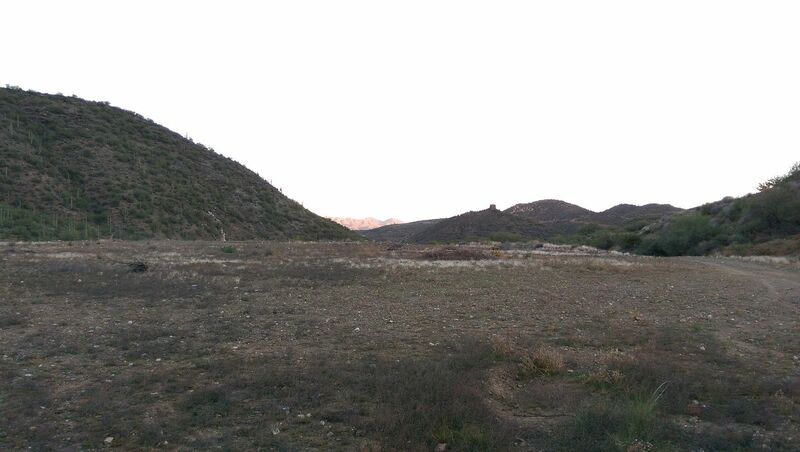 This is a flat wide open area, great for a large group to camp at. The trail narrows considerably from here southward, until you reach waypoint 6, making passing and turning around considerably more difficult. 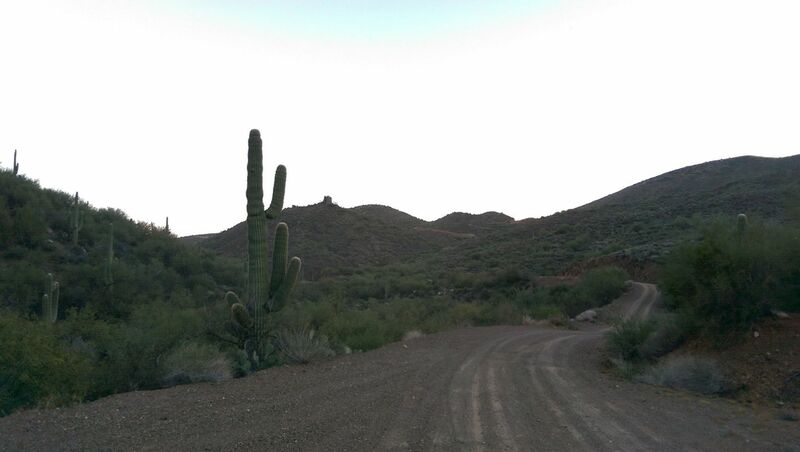 The density of cacti also increases, making driving on the side of the trail much more dangerous to your tires. 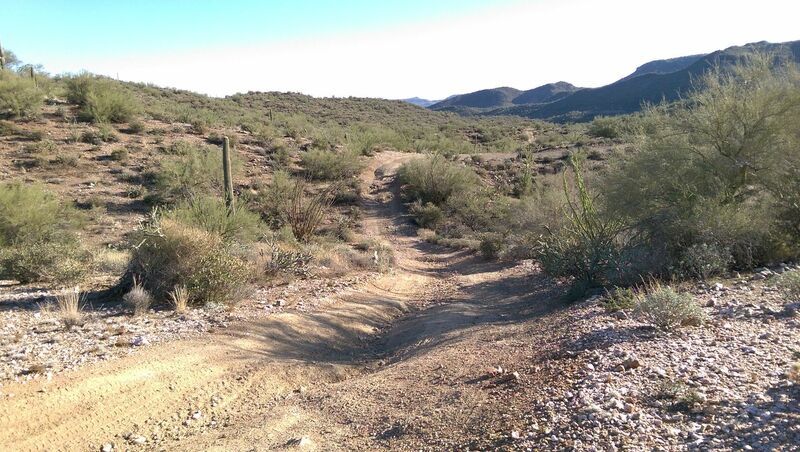 Continue straight (east) to head out to Black Canyon City. There are two staging areas. 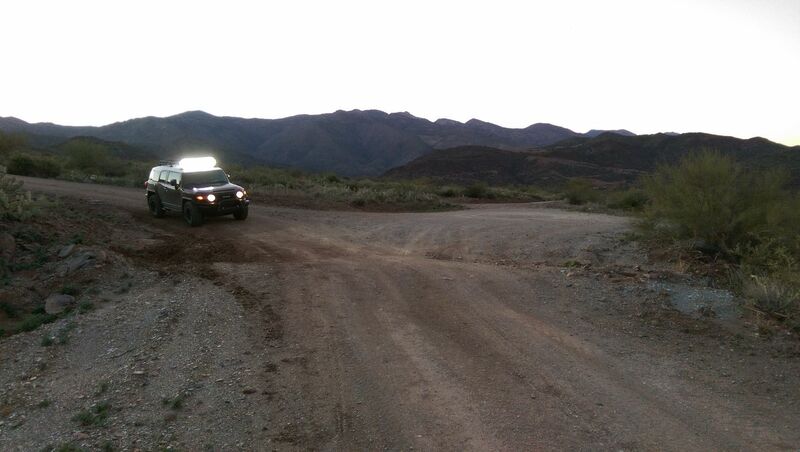 This intersection will take you to the upper one which is where the Black Canyon Hiking trail can also be found. 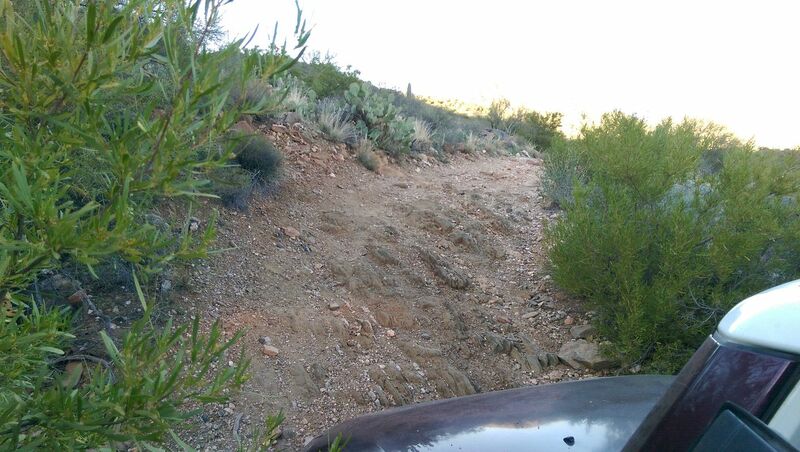 Stay on the lower one if you want to drive on the OHV trail. 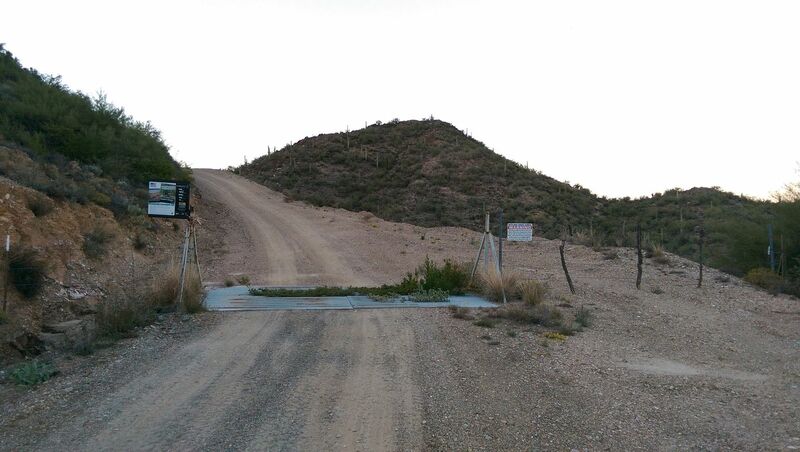 This intersection has a gate closing off the road that leads to private property. Don't go through the gate, and you'll be fine. 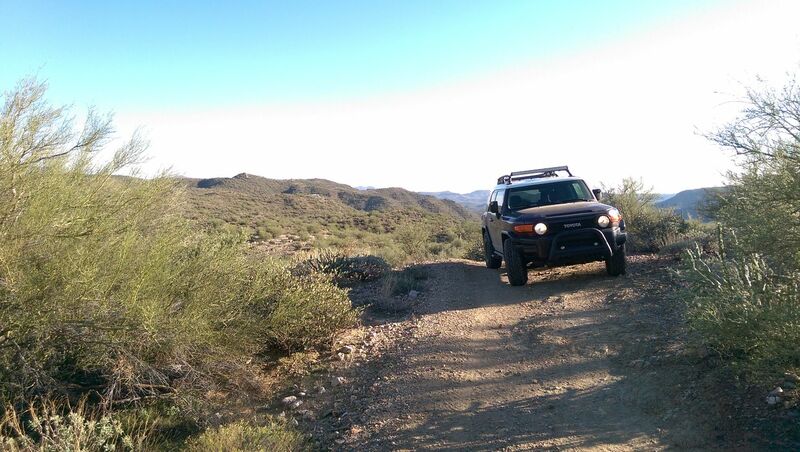 The Black Canyon OHV trail is on BLM land, but it's leased to the Boulder Creek Ranch. 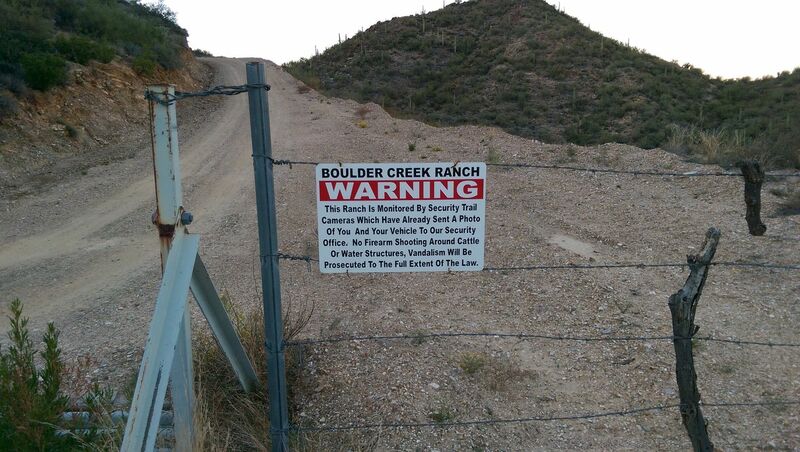 There are warning signs here (as well as similar signs in the Table Mesa Recreation Area) noting the ranch and that you are being monitored with cameras. 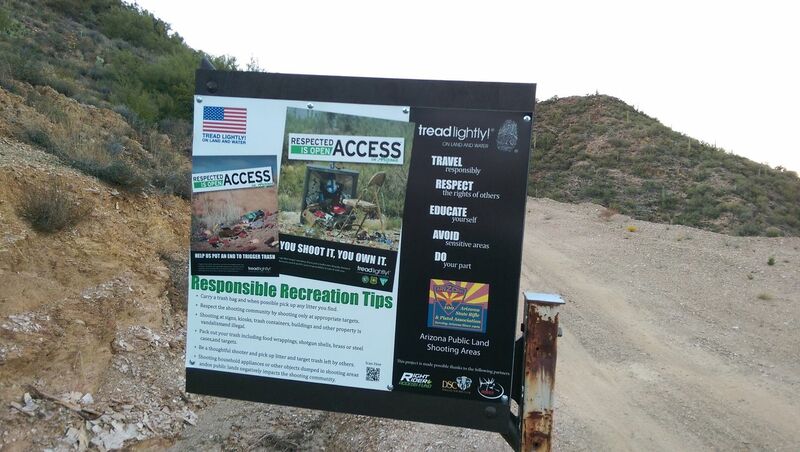 You'll also find Tread Lightly signs here reminding you to treat the land responsibility. 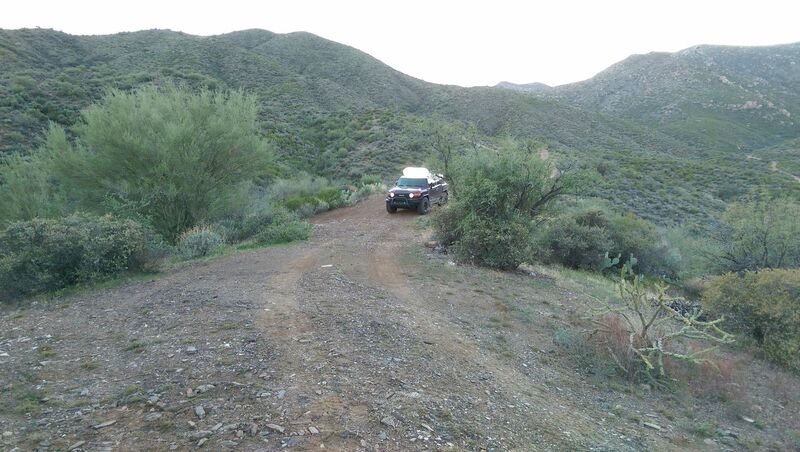 You'll also find various other hiking trails and smaller dirt road intersections through this area but stay on the main road to avoid entering private property. 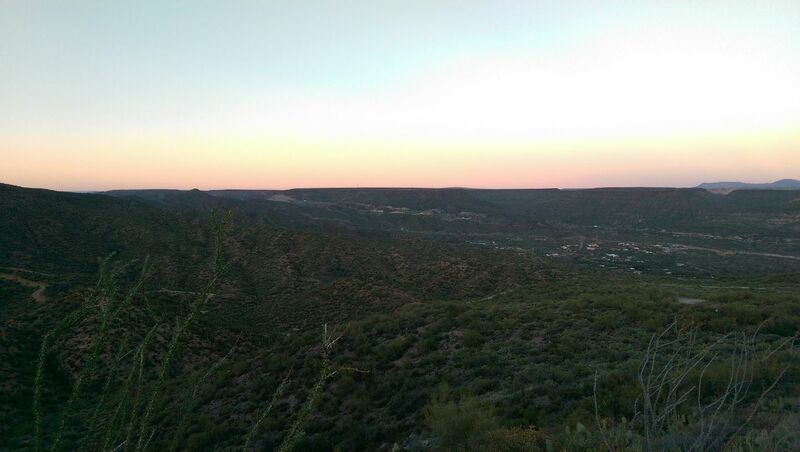 There's a nice view of Black Canyon City along this portion of the road. Stay right (west) to head into Black Canyon City. Going left (east) will take you into private property. 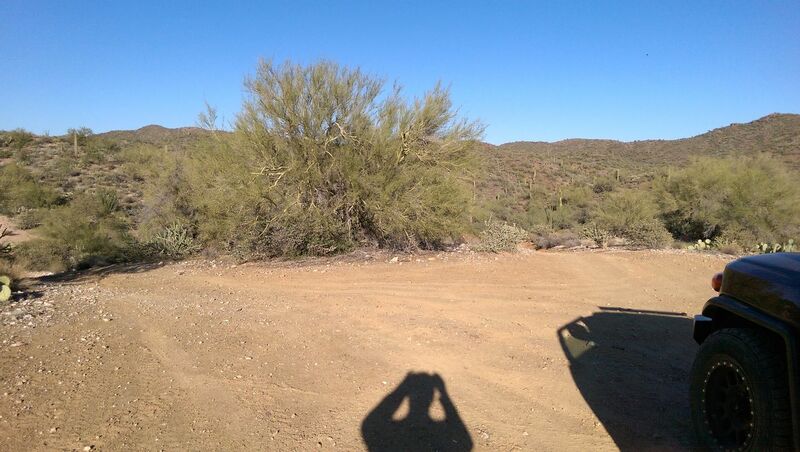 If your approaching from Black Canyon City, go left (southwest) to avoid private land. 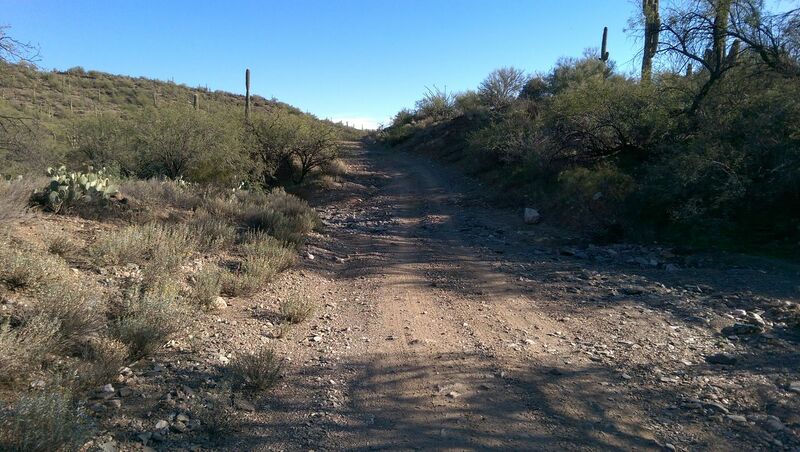 This unmarked dirt road meets up with the paved road Lisa Dr. within Black Canyon City. You'll turn right (south) onto Lisa Dr. to head out towards Maren Ave, which will take you west to Maggie Mine Rd. 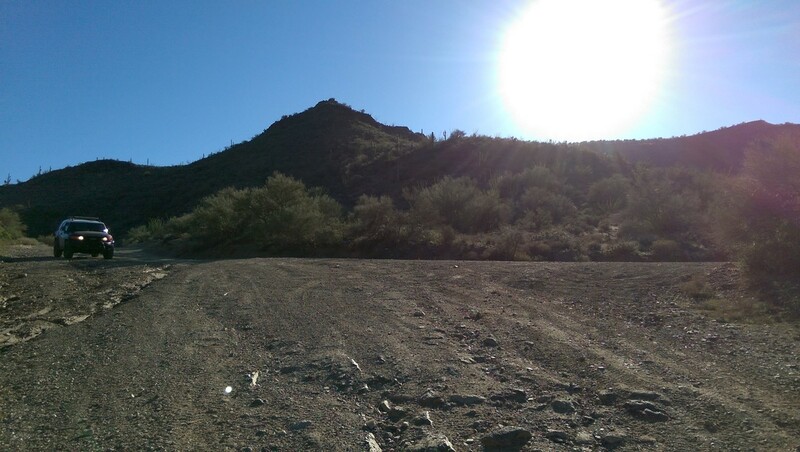 Maggie Mine Rd. 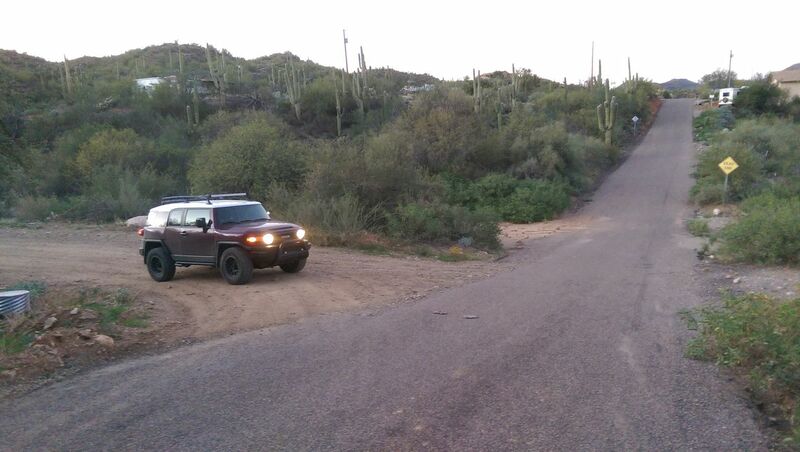 will take you south to Old Black Canyon Highway. 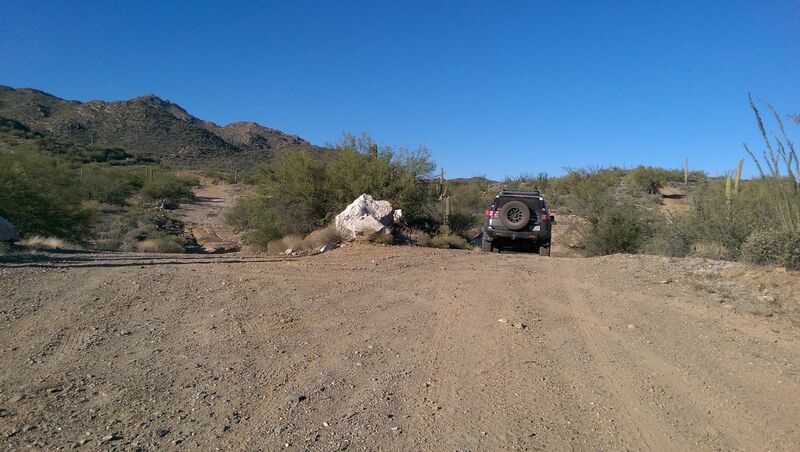 The first challenge of this back way to Black Canyon City four-wheel drive trail is getting to it. 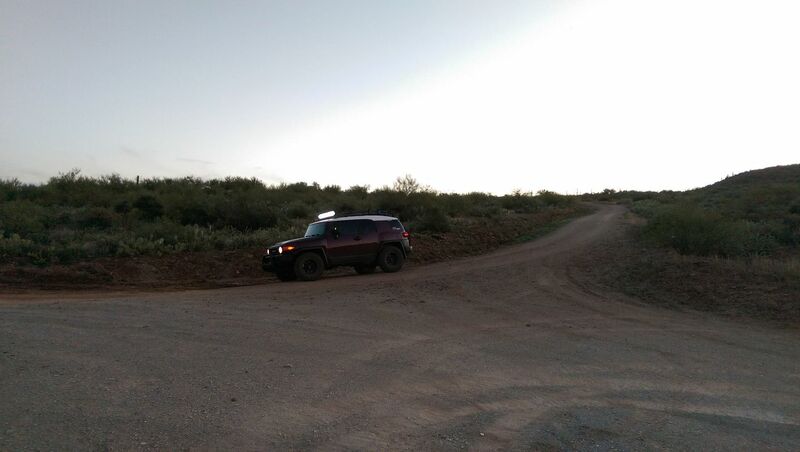 The easiest explanation is to take BLM 9999 Trail within the Table Mesa Recreation Area all the way north to where it intersects with 9958 and 9959. 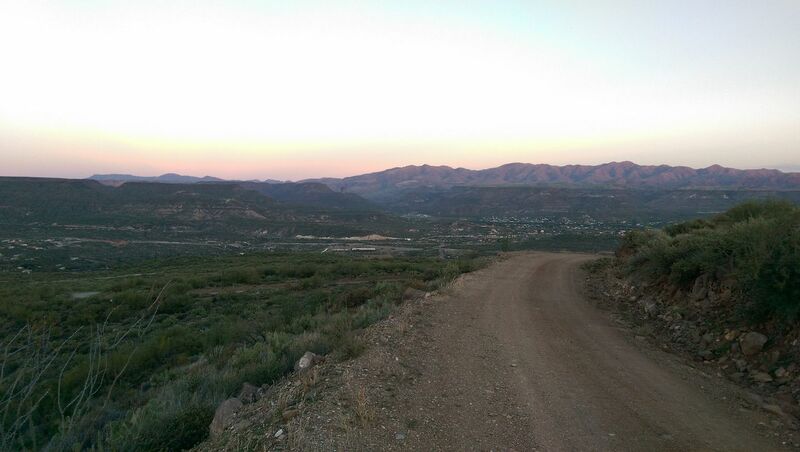 From here you'll continue straight ahead to continue north along 9958 into the Mountains. 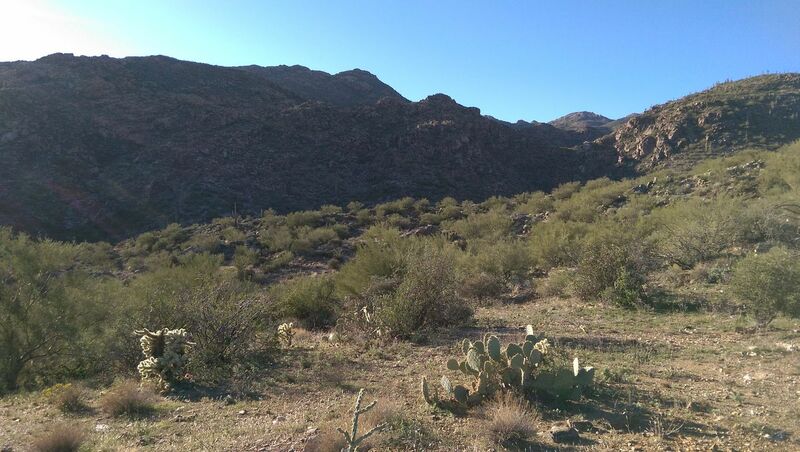 If you want to start at the north end you'll have to start in Black Canyon City on Old Black Canyon Hwy near exit 244 off I-17 (Squaw Valley Rd.). 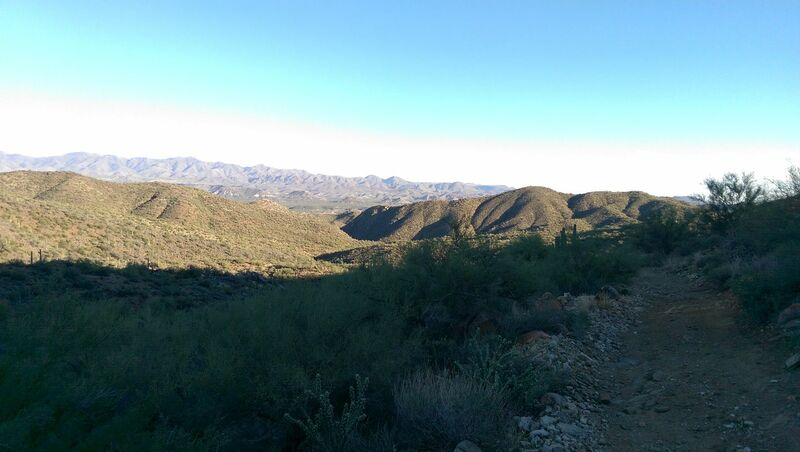 You'll then head west on Maggie Mine Rd, staying right past Thompson Rd, continuing straight past Nasty Ridge Trail and Steven Blvd. then turn left (west) onto Maren Ave (which can be flooded when raining heavily). 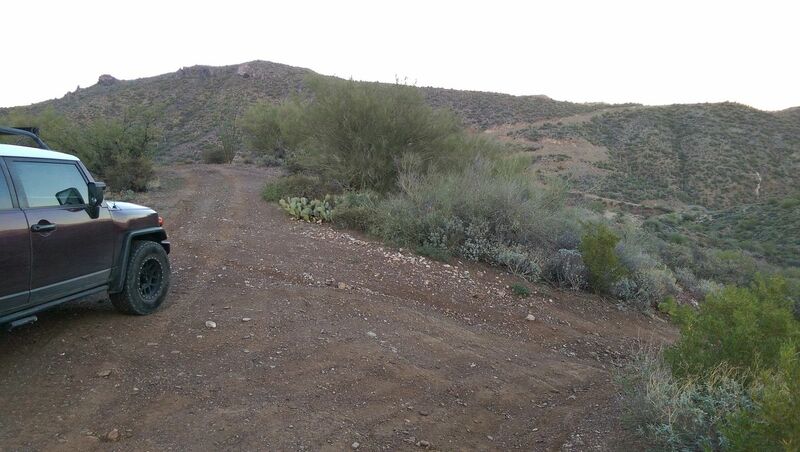 Maren Ave. will take you to an intersection with Lisa Dr. where you'll turn right onto Lisa Dr. then north for almost 1000 feet until you see an unmarked dirt road on the left. 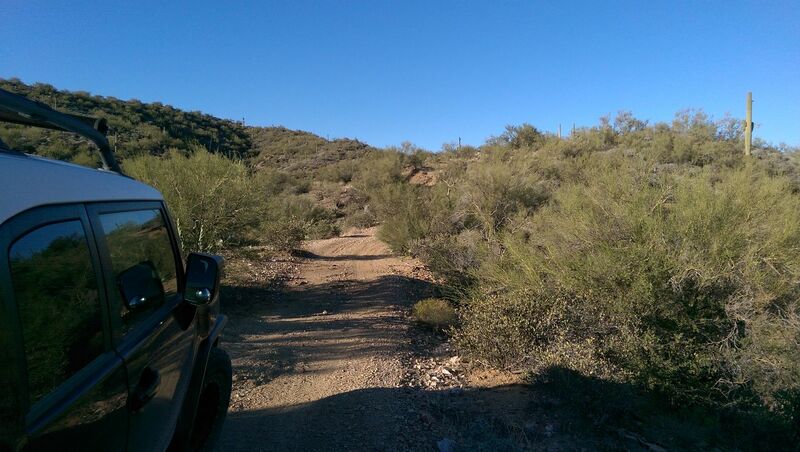 This dirt road takes you west to the Black Canyon Trails. 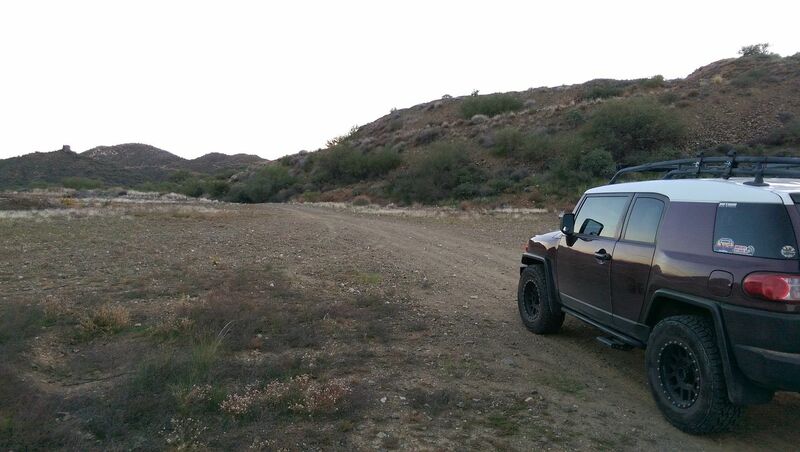 Table Mesa Recreation Area includes primitive dispersed camping and staging spots throughout. There's also a large area at the north end of the trail with plenty of room for a larger group. 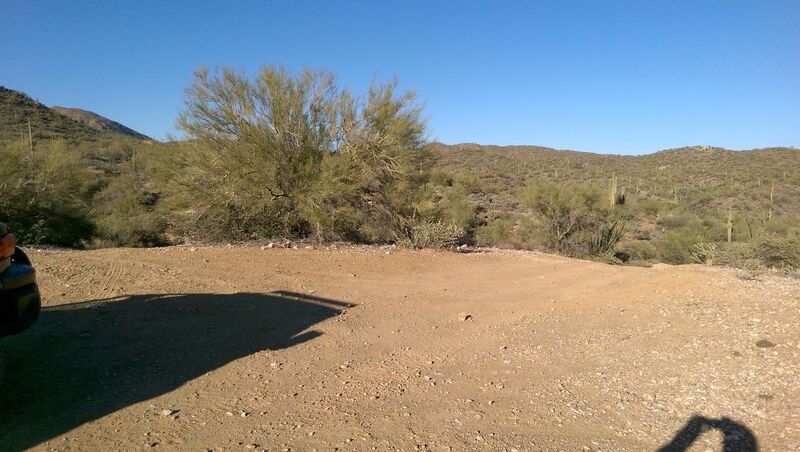 You can also find camping areas at a few other spots along the trail. 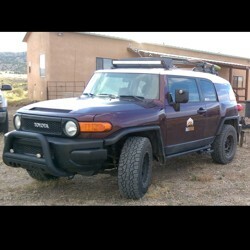 For more details see the BLM's web page. 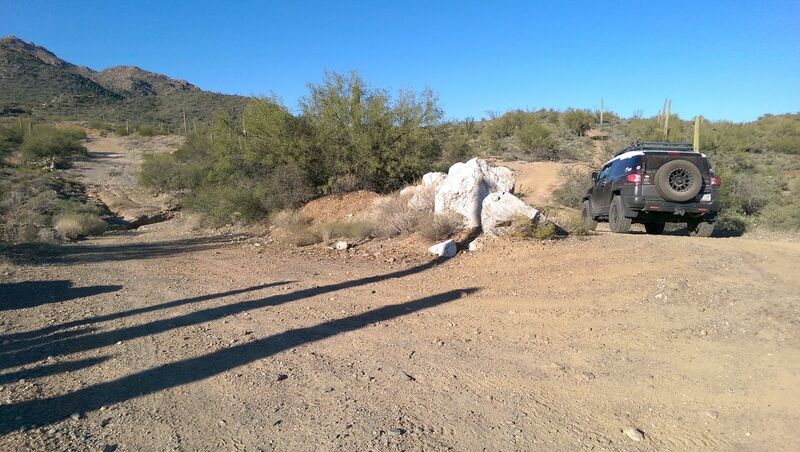 You can also find plenty of hotel choices half-an-hour to the south in the northern Phoenix area. There's also the Mountain Breeze Motel within Black Canyon City. 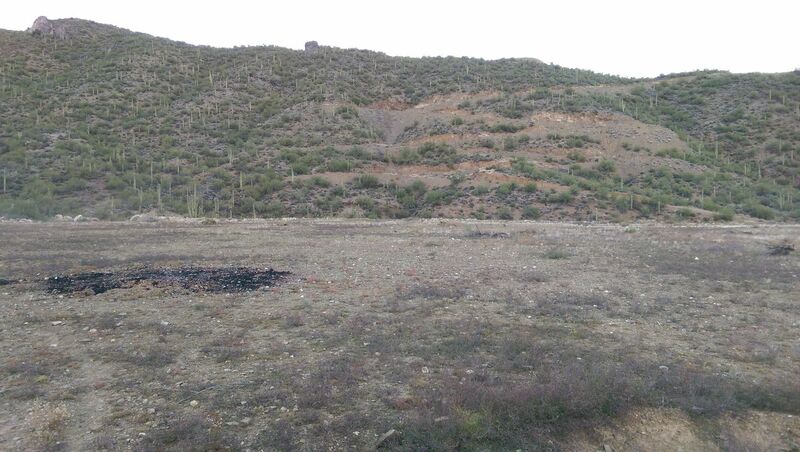 There's also used to be a Black Canyon City KOA but it's no longer listed on the KOA website. 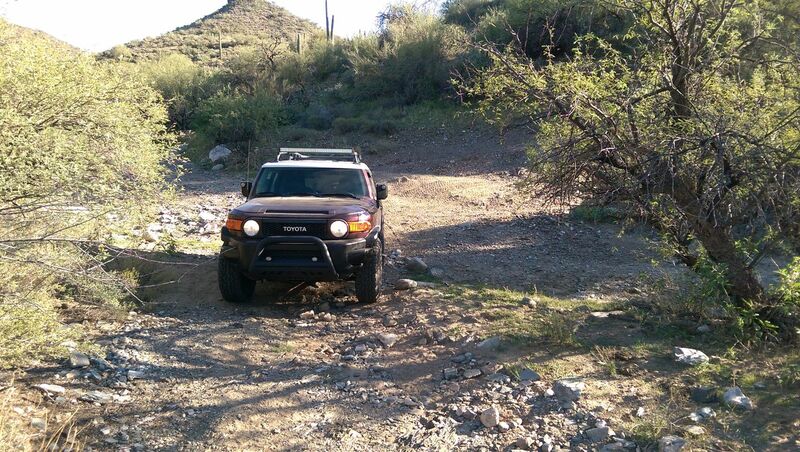 Q: Can I drive through this trail using 4 runner ? 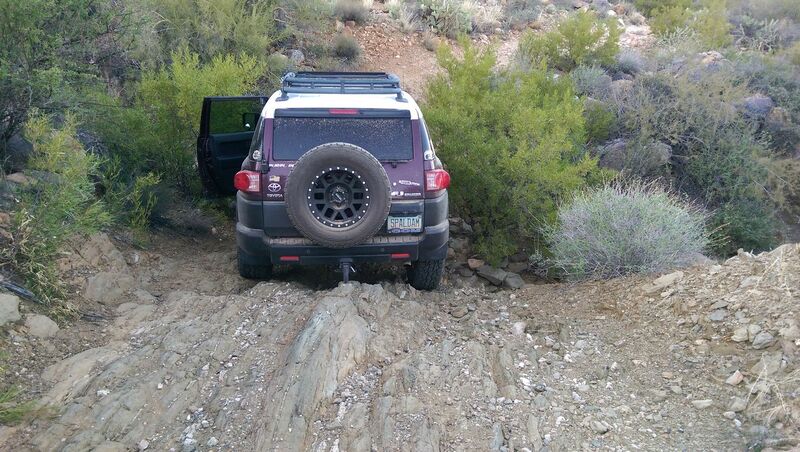 A: As long as it's a 4x4 with good tires, you should be fine. 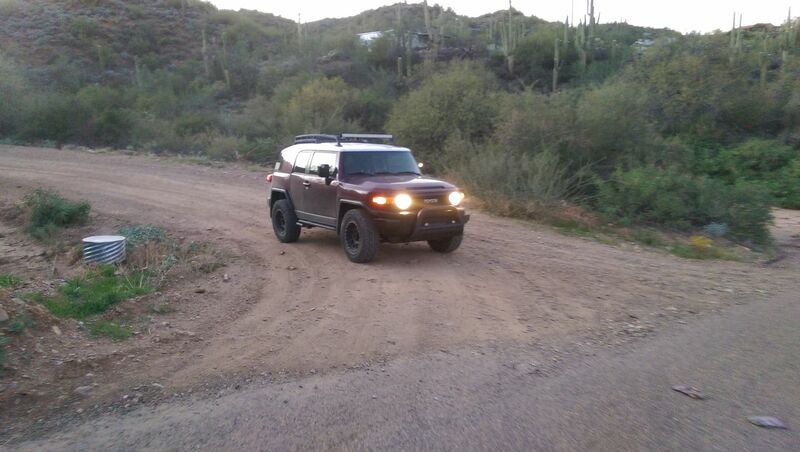 I would strongly recommend some form of traction control as I found it very useful in a couple of spots in my FJ Cruiser. 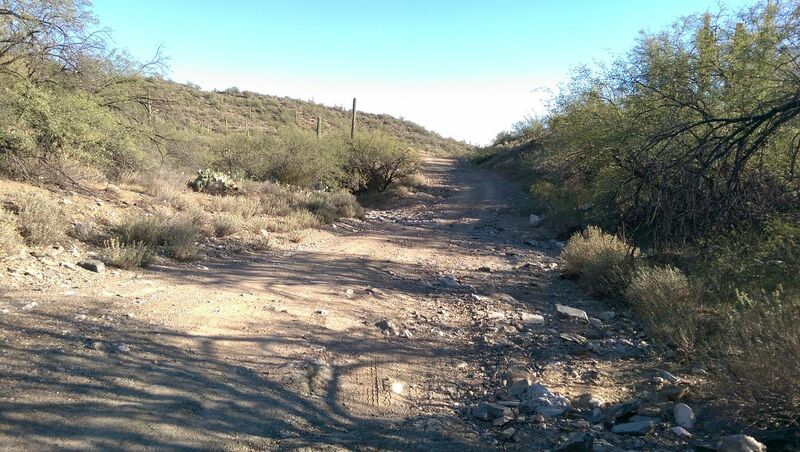 This trail is not maintained so expect some spots to have potentially changed from the writeup. You'll also likely get some scratches on the sides of your rig. Be sure to do a trip report after your trail run. 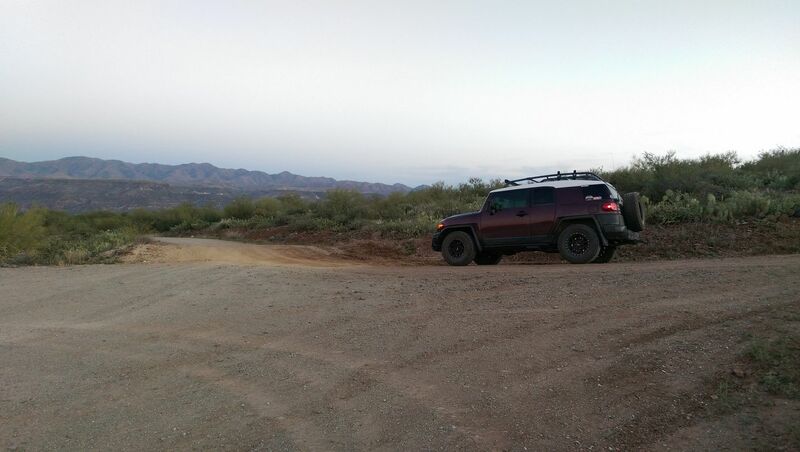 Ran this trail last night. 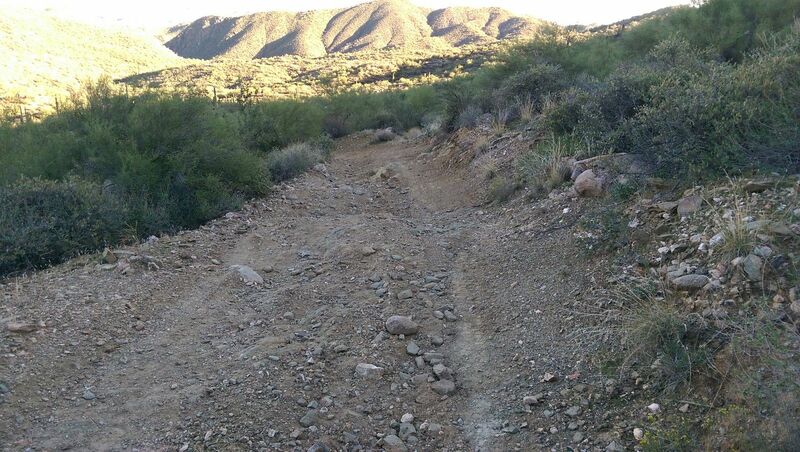 The trail has been washed out bad due to the heavy rains. Extreamly heavy rock and large ruts. 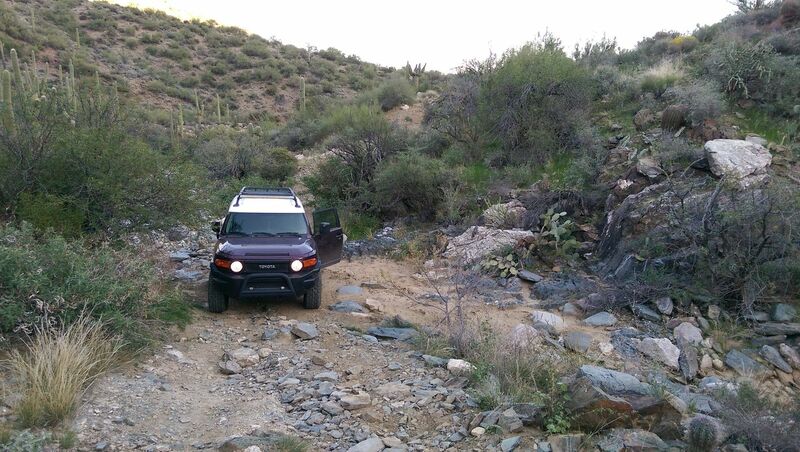 Rocks to 35"s on the steep sluice sections. 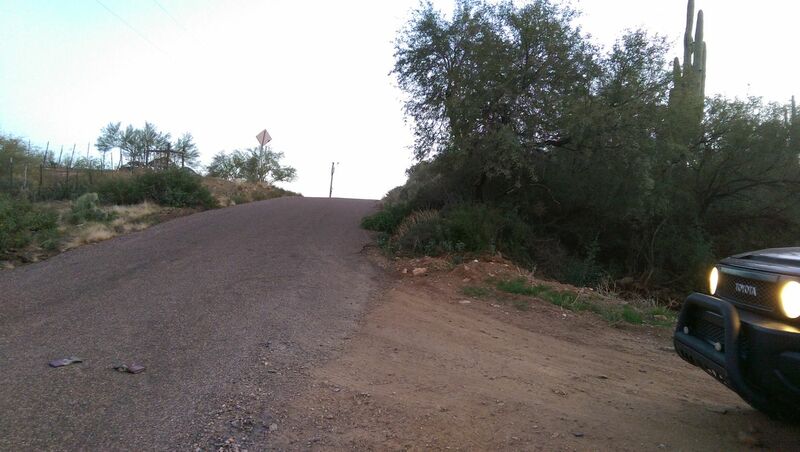 2 VERY dangerous side hill sections that carry a large risk of rollover for vehicles. 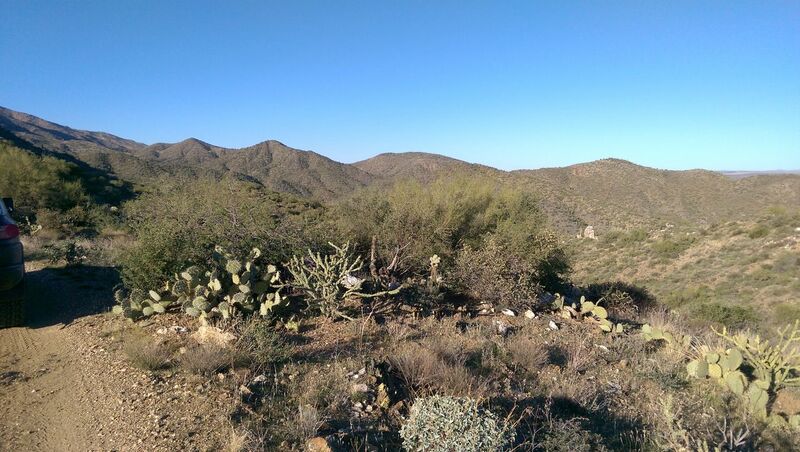 Thick overgrown brush and cactus ensure heavy pin striping even on a side by side. 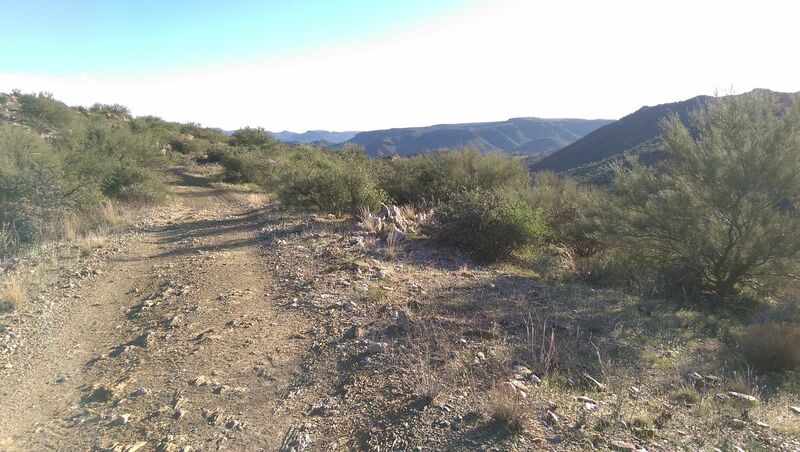 I ran this trail 6 months ago and it is twice as difficult now as it was back then. 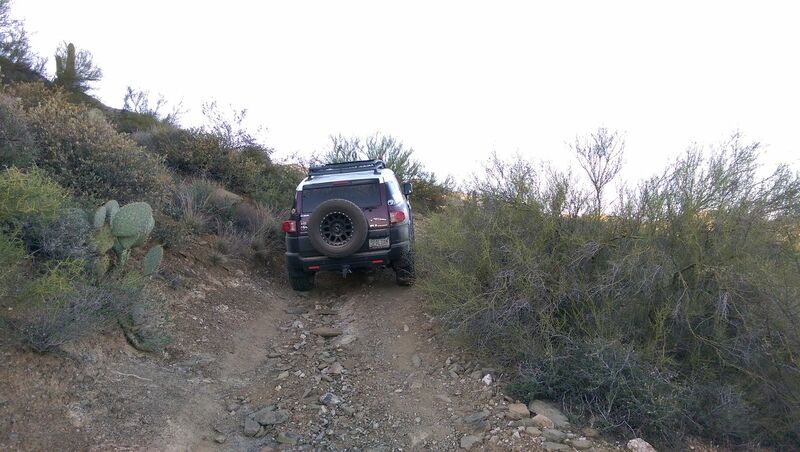 Vehicles attempting this trail should have at LEAST: -33" Tires with good beefy sidewalls and a good spare. 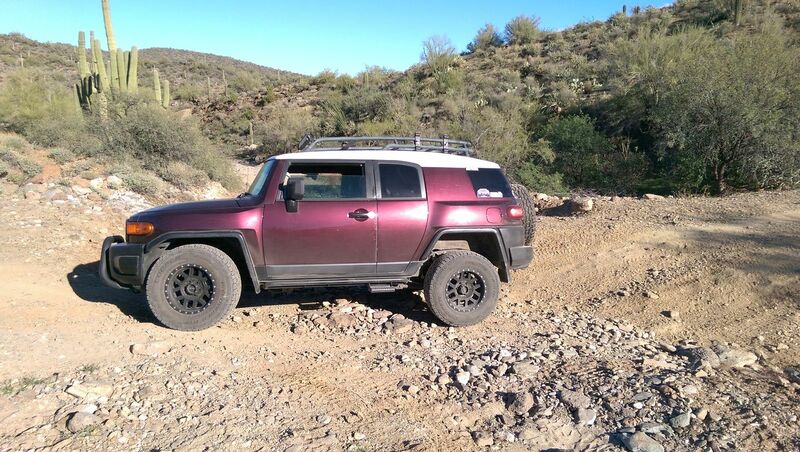 (Plug kit strongly advised) -Quality suspension lift with good articulation and travel. (4" lift or greater....) -At least 1 FULL LOCKER is either axle. DO NOT ATTEMPT THIS TRAIL ALONE! I cant stress this enough. There are no bypasses....very few spots safe to attempt to turn around..and no early ways out. 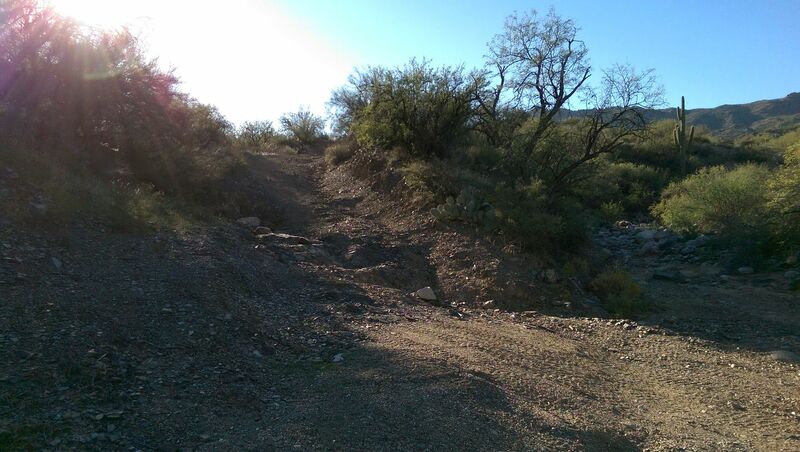 The most difficult section is a uphill sluice thats about 3/4 of a mile long and on a 20 degree incline. It is strewn with rocks exceeding 30" high and there is only one line you can attempt due to a cliff on your left and a wall on your right. 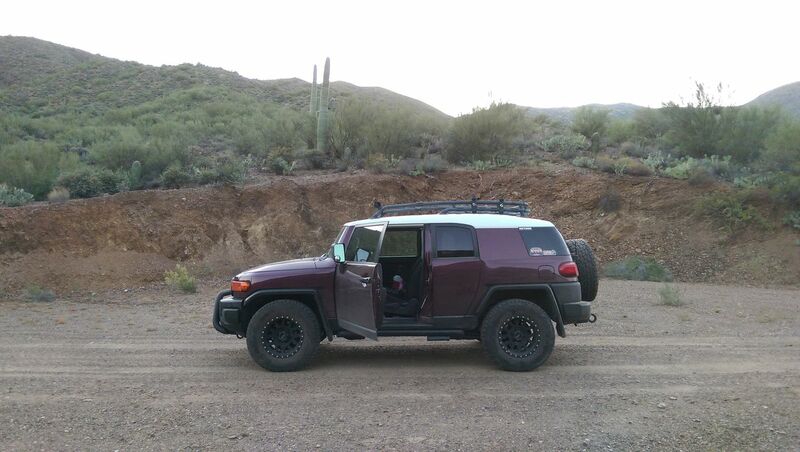 Tire placement is critical here. As well as moderate diff clearance. There are some small trees to winch off of if nesessary. 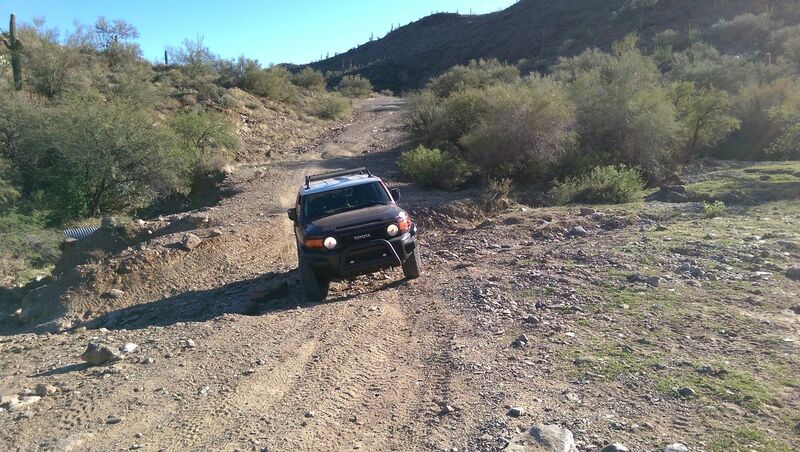 The Slate creek wash crossing is before the difficult section if you started at table mesa. 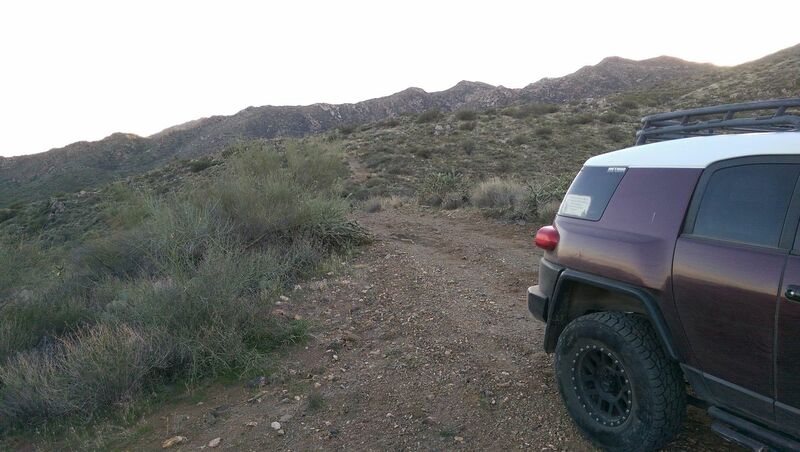 If you are uncomfortable with the climb up out of the wash or any other section of the trail you have traveled up to this point....NOW IS THE TIME TO TURN AROUND. It gets much more difficult after this point and much more dangerous.